Sirloin steak tips have deep flavor and a tender texture that calls out for a bright and texturally interesting accompaniment. Sirloin steak tips have deep flavor and a tender texture that calls out for a bright and texturally interesting accompaniment, so we chose our Southwestern-inspired Tangy Corn Relish. 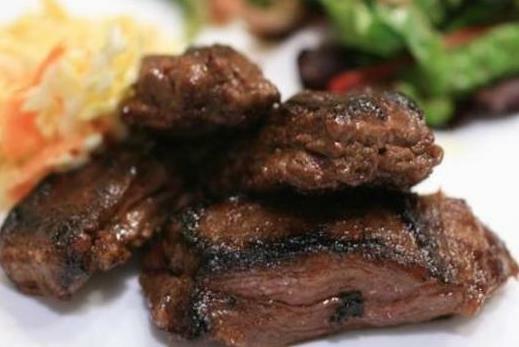 To keep the sirloin steak tips juicy despite the heat of the grill, we marinated the steak with a mixture of soy sauce, brown sugar, and potent spices and aromatics, which promoted browning and infused the steak with flavor and a bit of sweetness that was complemented nicely by the relish. For the marinade, whisk all ingredients in bowl until sugar has dissolved. Toss steak tips with marinade in 1-gallon zipper-lock bag; seal bag, pressing out as much air as possible. Refrigerate for at least 1 hour or up to 2 hours, flipping bag every 30 minutes. Before grilling, remove steak from bag and pat dry with paper towels. Discard marinade. 🍢For a charcoal grill: Open bottom vent completely. Light large chimney starter filled with charcoal briquettes (6 quarts). When top coals are partially covered with ash, pour two-thirds evenly over half of grill, then pour remaining coals over other half of grill. Set cooking grate in place, cover, and open lid vent completely. Heat grill until hot, about 5 minutes. Transfer steak to carving board, tent with aluminum foil, and let rest for 5 to 10 minutes. Slice steak thin and serve with relish.